Scuba diving in Cozumel is the main attraction to the island. Cozumel is the largest island in the Mexican Caribbean and is famous worldwide for all its watersports and it’s amazing coral reefs. People travel from all over the world to enjoy the watersports such as scuba diving, snorkeling and deep-sea fishing. Cozumel has the second largest barrier reef, making it the perfect destination for diving enthusiasts. Famous divers such as Jacques Cousteau have visited Cozumel specifically because of its warm turquoise crystal clear waters and its reef where you will find the very unusual black coral and more stunning marine life. Most of the scuba diving and snorkeling activity on Cozumel is focused on the reefs and shallow coral formations that extend from the southern tip of the island to just south of San Miguel on the west coast. All of the Cozumel beaches are protected and extend from the ferry pier in downtown San Miguel to the southern tip of the island, many of which are protected as part of an underwater national park. There are two main coral reef systems surrounding Cozumel, known as the Colombia and Palancar reefs. They are both easily accessible with plateaus beginning in less than 30 feet / 9 meters of water. 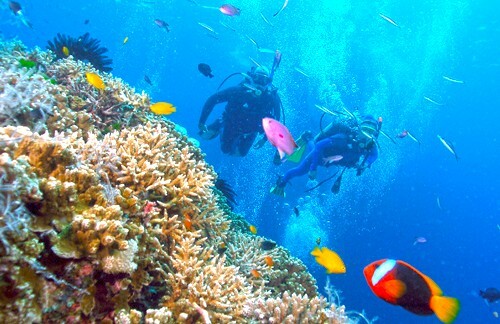 Scuba diving in Cozumel is so popular because of its stunning, abundant underwater sea life and brilliant colors. Many divers say it is the best dive they have ever experienced. You can also dive a the Chankanaab Lagoon. This is one of the most visited attractions on the island where divers and snorkelers can observe small coral and limestone formations at 6 to 30 feet / 2 to 9 meters. If you would like to scuba dive in Cozumel we can help you by recommending the best scuba instructors or scuba schools for experienced and non-experienced divers alike. We can book your dives for you or a course to get PADI certified whilst on vacation in Cozumel.